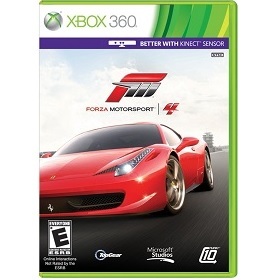 Forza Motorsport 4 is a Xbox 360 game in the Driving genre. The game was published by Microsoft Studios and developed by Turn 10 Studios. The game has an ESRB Rating of E (Everyone 6+) and was released on 2011-10-11. The game's official site can be found at www.forzamotorsport.net/en-us/games/fm4. Forza 4 is one of my favorite racing games of all time. The graphics, especially in autovista mode, are breathtaking. I found the career mode more fleshed out this time around and really enjoyed the vast array of cars that I could choose from. As an aside, Top Gear was one of my favorite shows while it was on the air, so having Jeremy Clark in the game is awesome. There aren't a whole lot of negatives in my opinion. Sure, more tracks would have been nice as well as the ability to drive at night or have weather like rain or snow - but these are extremely minor complaints. Overall, I would highly recommend this game.